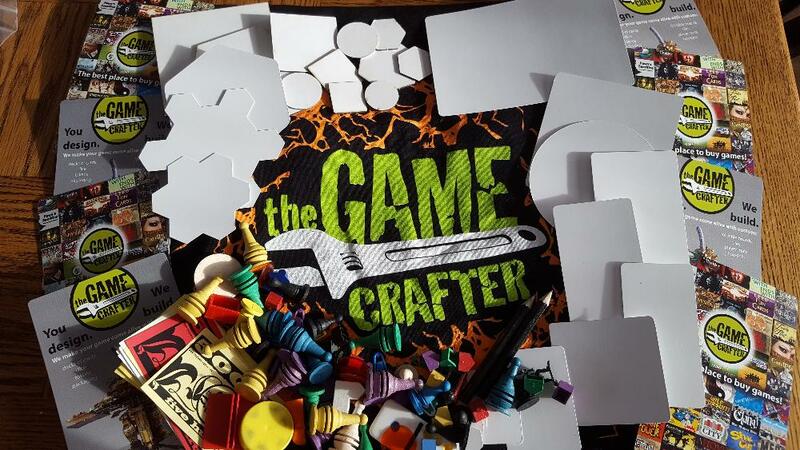 The Game Crafter has created a special program where we sponsor designers to go promote their games, and The Game Crafter at local regional conferences. This is a win-win situation. We give you some money and prizes, you promote us and your games! To apply, click on the link at the bottom of this page and fill out the form. You must have games already published to The Game Crafter Shop at the time that you submit your application. This way we know that you know how the process works. The con you apply for must have an attendance of at least 200 people. You are responsible for registering with the convention and making all other related arrangements. You are responsible for all fees associated with the con up-front. TGC will reimburse you after you attend the con. See the Benefits section for details. You are responsible for ordering copies of your game to demonstrate at the con. You are responsible for your own travel costs and other expenses beyond what TGC is sponsoring. Money toward the cost of your table and other expenses. (See the table below.) You will be reimbursed by PayPal within 10 business days after you have attended the con, and submitted your table photos back to us. See also Rules of Attendance about the photos. A TGC branded T-Shirt. You may wear it yourself or give it out as a prize. Depending on your event, we may adjust what promotional materials you receive from above. * The Game Crafter reserves the right to offer reduced reimbursement for 1-day conventions or those that are not dedicated to tabletop gaming. Reimbursement funds are also sometimes reduced when we're supporting a significant number of events. You must be familiar with TGC's services so you can answer questions about them. In addition to promoting your games, you must act as a representative of TGC's community and answer questions about TGC. You must use the table cover we provide so that the TGC logo faces out into the room and can be seen by maximum people. You must place the brochures and the game parts we provide on the table so that passers by can view them. You will make an effort to hand out all of the brochures we send you. Be well groomed and courteous at all times. You must distribute the certificates to the attendees. You cannot use them yourself or give them to your friends. Either the host or a helper must remain at the table at all times. If you have read and agree to all of the above terms and requirements, then we invite you to click here to apply. If your application is approved, you'll want to read the helpful hints and resources below to ensure you have a great experience at your event. So you've been approved as a host designer at a TGC Designer Table, now what? These are a few tips we've put together from our experience at cons. Be yourself, unless yourself is unsocial, mean, or obnoxious. Know your game! Be able to play your game without ever looking at any rules. Be clean, hygienic, courteous, and professional. This shouldn't need to be said, but for so many it does need to be said. Keep gum or breath mints near by. Bring a copy of your game to play (the demo copy), and several to sell. You need not bring 100 copies. Bring 5 to 10, that should be enough. If you run out, great! Hand them a TGC brochure and tell them it's on the site. This way if you sell out you have a plan, and if you don't sell out you're not stuck with a lot of extra copies. Order your copies from TGC several weeks before the con to ensure you have them and everything is correct before the show! Have your game set up and ready to be played by passer's by. Unless it's a brochure or business card, don't give away free stuff. If a distributor or publisher shows up at your table, by all means ignore the previous rule and give them a free copy. Stay at the table! I know it's fun to go out and play all the other pretty games at the con, but you're there to sell your game. Stay there and do that! Let the rookie win! In almost every case, it's best to let the people who try to play your game win the game. There are those competitive few who will want to buy your game because they couldn't beat you at your own game, but most will want to feel accomplished. So let them win! Salesman should not be a dirty word. Sales are how the world goes round. "Best selling author" is a term you hear all the time, and nobody really cares about the "best writing author". After all, if you're not willing to sell your game, why should anybody want to buy it? With that in mind here are some tips to help you sell more games. Be seen! Put up some catchy posters about your game that draw the eye. Wear an obnoxious t-shirt that makes people see you (but not freak them out). Make sure the parts we give you are spread out at the front of your table. Lots of people like to come over and touch the parts. Let them. It's a conversation starter. Make eye contact and call out to the person walking by with a 3 to 6 word pitch: "Wanna kill some orcs?" Smile. It's a simple thing. Don't look mean. Don't have a defensive posture. Just smile. People want to be invited into your booth, and this is a great way to bring them in. Be excited! Be exciting! A little enthusiasm will go a long way toward people wanting to see what you're about. Do whatever it takes to draw someone into your booth. If that means that you're standing in the aisle directing them to your table, then do that! Whenever possible, stand rather than sit. It's more inviting. It means you're excited and invigorated and you have a great story to tell. Have a great story to tell! Enthrall them with the high adventure of your game, or the epic win that your previous visitor just had. Tell them why your game is so cool. But keep it brief. Listen to what your visitors are saying. Point out aspects of the game that they want to know about based on what they tell you. If you listen they will tell you how to make them like your game. They want to like your game, or they wouldn't be talking to you. Give them the reason to like it enough to buy it. Avoid having someone come back to your table later, they'll likely forget about you. Get them to sit down and demo the game, even if it's only for a few minutes. At this point your product should sell itself. If it doesn't, then maybe your product needs a bit more work. Don't be afraid to use a gimmick to sell more games. For example, if someone plays the game, give them a 20% discount. Or if you're playing your game with a group of people, give the winner one of the $5 TGC gift certificates. Kevin Warner is a game designer and TGC community member who recently hosted a Designer Table at a game convention. After the experience he wrote an article called " Running a Hot Convention Table Without Booth Babes" because he wanted to share tips and suggestions on how game designers can run a successful booth at a convention.